After founding Jerk with a Bomb in the late '90s, Stephen McBean had by the mid-2000s transformed the Vancouver-area band into a group called Black Mountain. Drawing on blues, psychedelia, acid rock, and the Velvet Underground, Black Mountain's sound was a cross between the darkness and grit of the Warlocks and Brian Jonestown Massacre's trippiness. After debuting in October 2004 on Jagjaguwar with the 12" Druganaut, Black Mountain stayed with the label for an eponymous full-length, issued the following January. Joining McBean for the album were local players Matthew Camirand, Jeremy Schmidt, Joshua Wells, and Amber Webber, listed collectively to preserve the band's communal ethic. (Black Mountain ran concurrent to and intermingled with McBean's other band, lo-fi classic rockers Pink Mountaintops.) 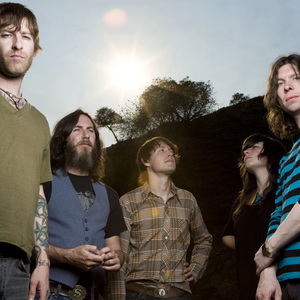 In January 2008, the group released their sophomore album, In the Future, and showed off their willingness to explore proggy (and druggy) territory with the 17-minute opus "Bright Lights." The group's third, full length album, Wilderness Heart, arrived in 2010.